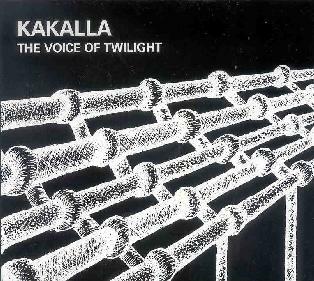 Kakalla - "The Voice Of Twilight"
Kakalla is a Massachusetts based quartet that play a brand of jazz that is highly thematic, sometimes ambient, and has a strong progressive rock feel at times. The band consists of acoustic bassist, composer and leader Thomson Kneeland, drummer and percussionist Mike Connors, trumpeter Jerry Sabatini, and guitarist Nate Radley. The music can be characterized by fiery jamming jazz in which each musician occupies a space that makes individual statements while forming a cohesive whole. It can also be more orchestral, moving through multiple narrative segments that include accessible but intricately structured playing. The musicianship is top notch but each member is also notable for the expressive nature of his performance. Sure, there's some hot playing to be heard, but overall the musicians favor carefully considered statements over flash, which results in plenty for the attentive listener to digest. Sabatini's trumpet often carries the lead melodies, though bass, drums and guitar can dominate as well. Radley's guitar is a standout, not for the dominant role that the instrument so often plays, but for the atmospheric edge it gives to the music on some tracks. His chords and notes have an ethereal quality that allow the listener to drift along while the trumpet, bass and drums flail away. A wonderful sound and feel. "Stalingrad" is one of my favorite tracks. It's jazz based but orchestral, and has that prog rock feel that we hear throughout the album. There's a strong sense that a story is being told, with the theme developing steadily and taking numerous twists and turns, from intense marches to light ambient jazz bits. "Euclid's Recursive Nightmare" rocks out nicely and again includes a prog rock sound. Beautiful guitar work by Radley on this one. Another highlight is "Threnody", which brings to mind Dr Nerve but without the searing aggression. Another track that really rocks out and some great playing from all. In summary, Kakalla cover a great deal of ground and fuse a lot of influences, which according to their promo literature is very much the bands goal. Jazz is at the center of their universe, but so is orchestral music, progressive rock, 70's styled fusion, and many other elements which make them ultimately difficult to describe. And that's a good thing!! The music is highly accessible, but challenging in a complex prog rock way rather than necessarily being avant-garde. A thoroughly enjoyable listen. For more information you can visit the Thomson Kneeland web site at: http://www.thomsonkneeland.com. Contact via snail mail c/o Weltschmerz Records; Attn: Thomson Kneeland; PO Box 443; Upton, MA 01568.